(next updates are free for one year). it can be used in multiple devices, but always by the same user. If you are a company needing a bulk license please contact me. If PayPal is not available in your Country please contact me. I'm pretty sure you will love Magicento. I'm a Magento developer too, I use Magicento everyday and I can guarantee it's a big time saver, also you will enjoy much more developing in Magento with the help of Magicento. 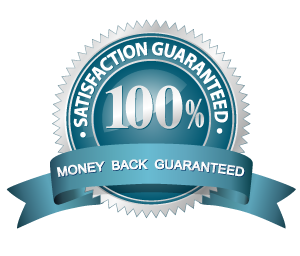 But If you are unsatisfied for any reason, please email me and I will issue a refund. I'm always trying to improve Magicento, so if you find any problem or you have new ideas/suggestions you are welcome to contact me by email or skype. Note: Magicento adds only one shortcut for all its custom actions: ALT+M (Option+M in mac), this is context aware (you will see different actions depending where the edit cursor is). Event search (now works with dynamic events too like "_save_after"
Use ALT + M > Create Grid and Form anywhere. 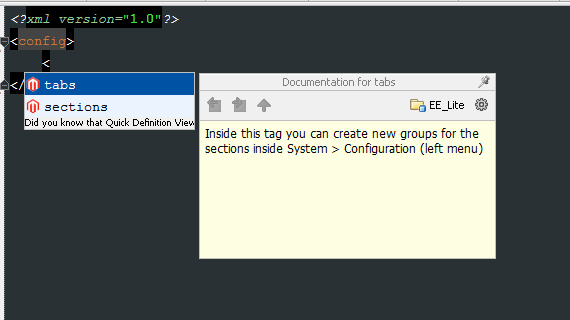 All the fields have tooltips to help you understand what it does if is not intuitive enough. 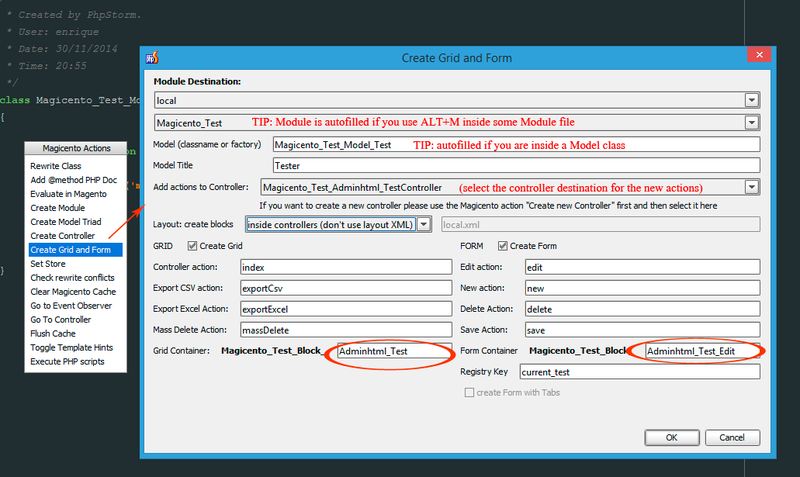 TIP: is you use ALT+M inside the model class you want to create the form for, then Magicento will autofill some options for you. These are the new files (Blocks) created by Magicento. Also there are new actions inside the controller (if you select that option). 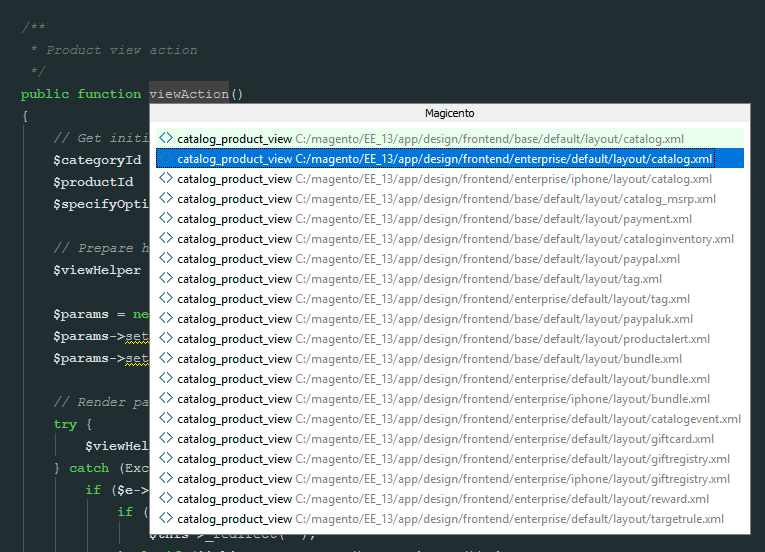 Use ALT + M > Add to solved rewrite conflict list when editing some class with a rewrite conflict. Adding the class to "Solved Rewrite conflict list" will avoid Magicento warnings about that conflict. You can do the same from Magicento settings, this is just an easier and faster way to do that. This could be useful with custom folder structures like the one below. Magicento will try to detect the correct folder to create the new files (controllers, models, etc) but if it can't decide it you will be asked where you want to create them. 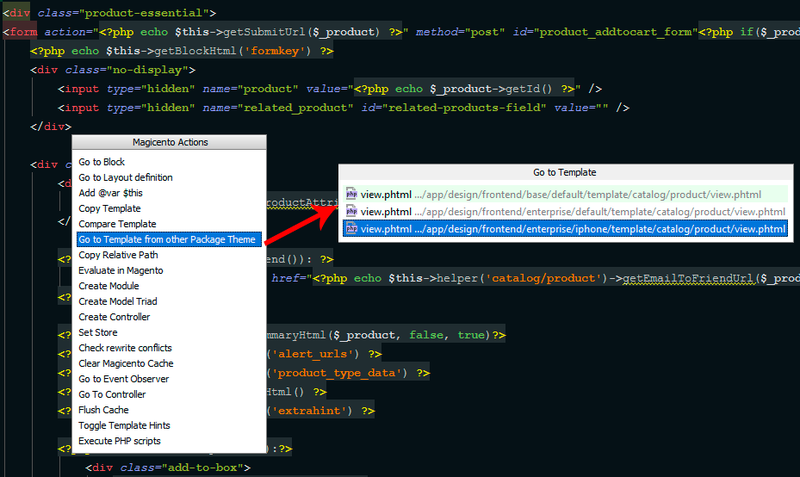 Use ALT + M > Go to Template from other Package Theme when editing some .phtml file. Use ALT + M > Copy Relative Path when editing some .phtml file. Use CTRL + SPACE. Magicento should detect better the class when using chained methods. Anyway, the support for this is not complete (see the example below). 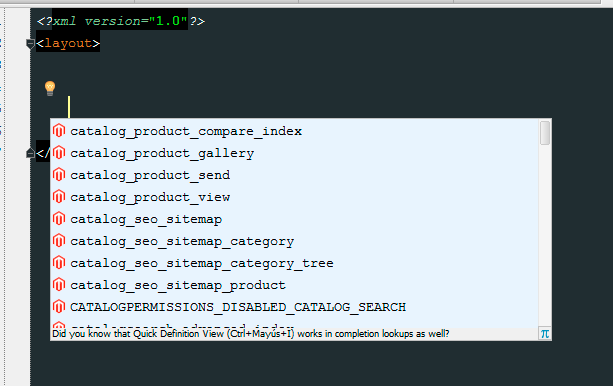 The problem here is that Magento is using a bad @return PHPDoc. 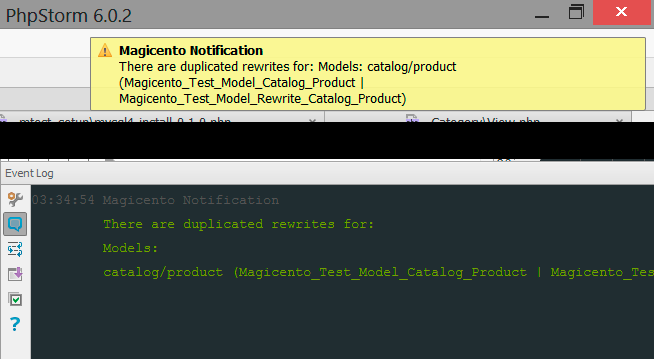 Magento sometimes is using things like "@return Varien_Object" and it should use "@return $this" instead when the method is returning $this. 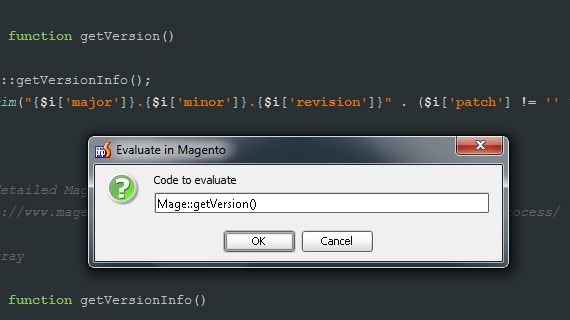 Evaluate in Magento is showing the result inside the information panel too (to allow copy and check previous results). And is not showing with a dialog if the result is too long. 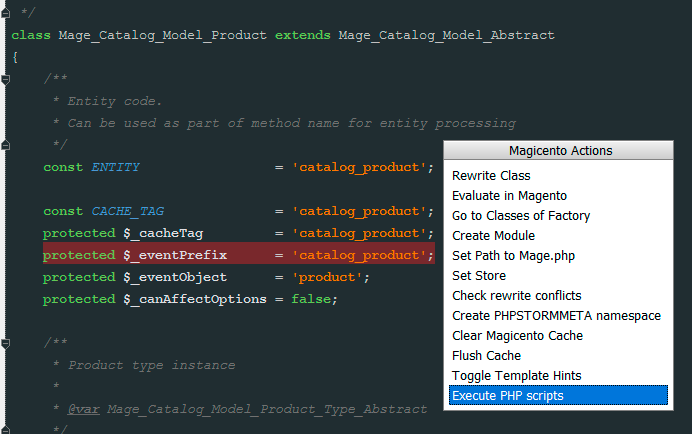 You can now execute IDE actions from your Magicento PHP Scripts. 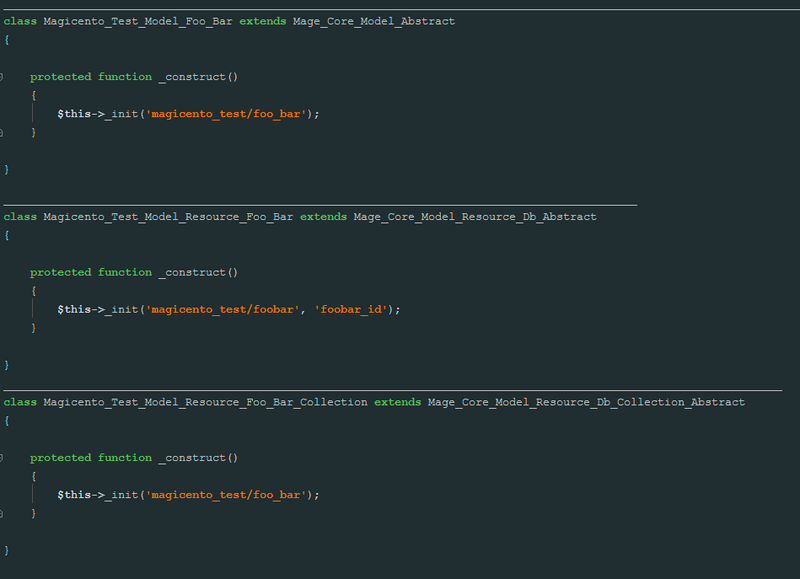 You just need to assing some values to the $GLOBALS['MagicentoActions'] var. Use ALT + M > Go to Event Observer anywhere. // I'm working on adding more intelligence to the foreach item type inference. Use CTRL + SPACE inside a foreach with a collection. 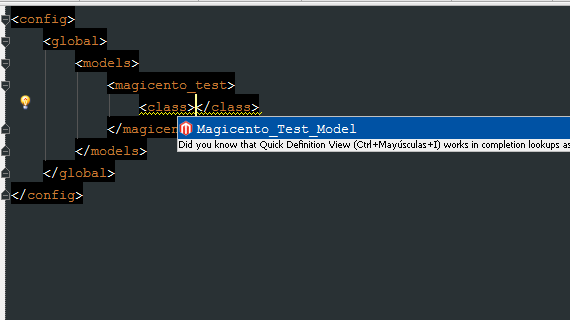 Magicento will infere the model type automatically. You don't need to add @var phpdocs. 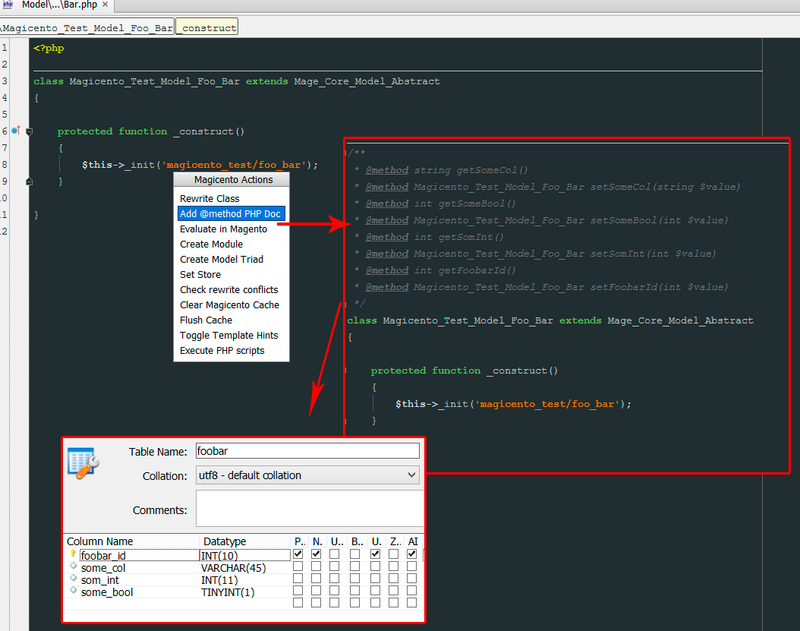 Added data installer, mysql4 prefix is optional, autocomplete for namespaces. New delay setting for PHP features. 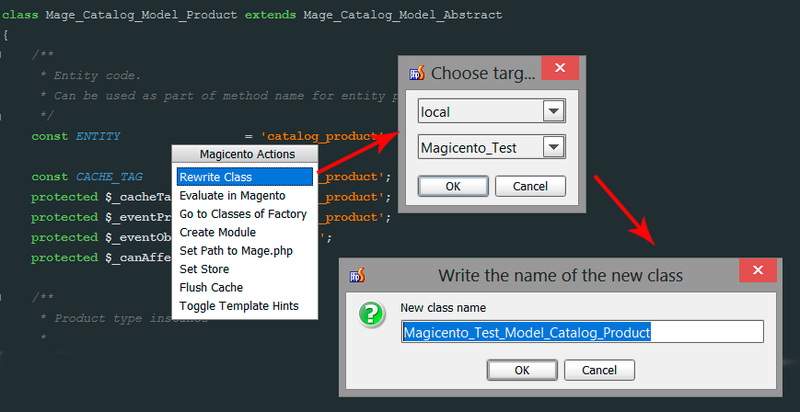 Magicento will create the method in the corresponding class (and will create the class if it doesn't exist too). 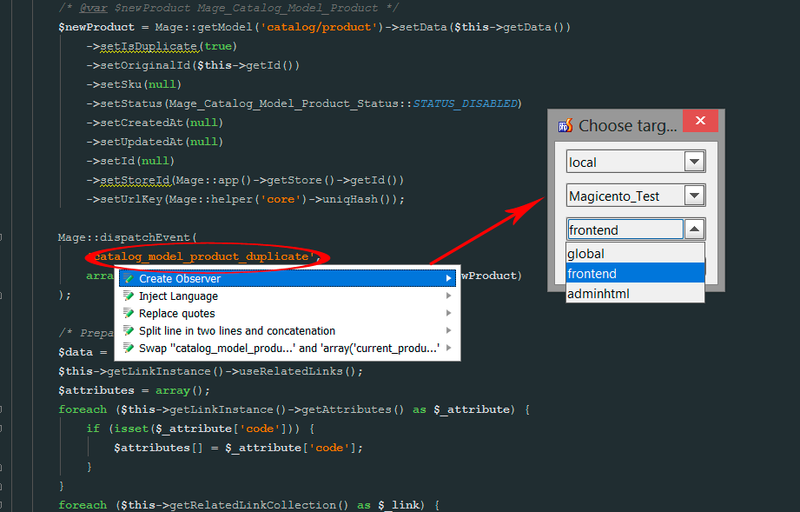 You can use that script as a reference for generating the .xml used by Magicento for all your models. 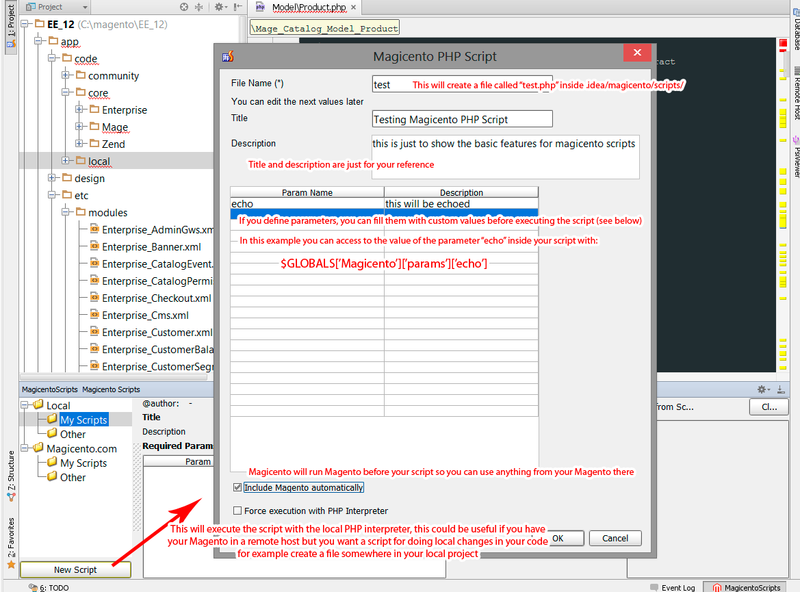 You will probably need to adapt it a bit (for example execute Mage::app(); first), and upload and execute that script to your Magento server, manually. 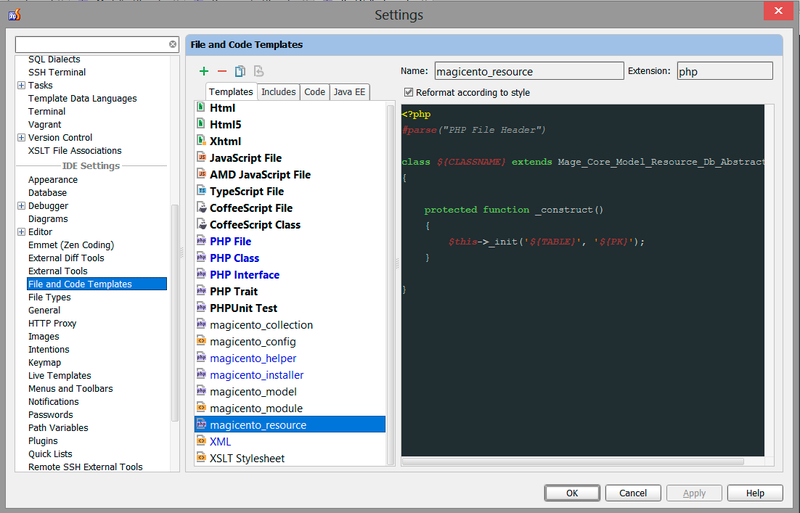 Magicento will let you choose the package and theme and will create and open that file for you. 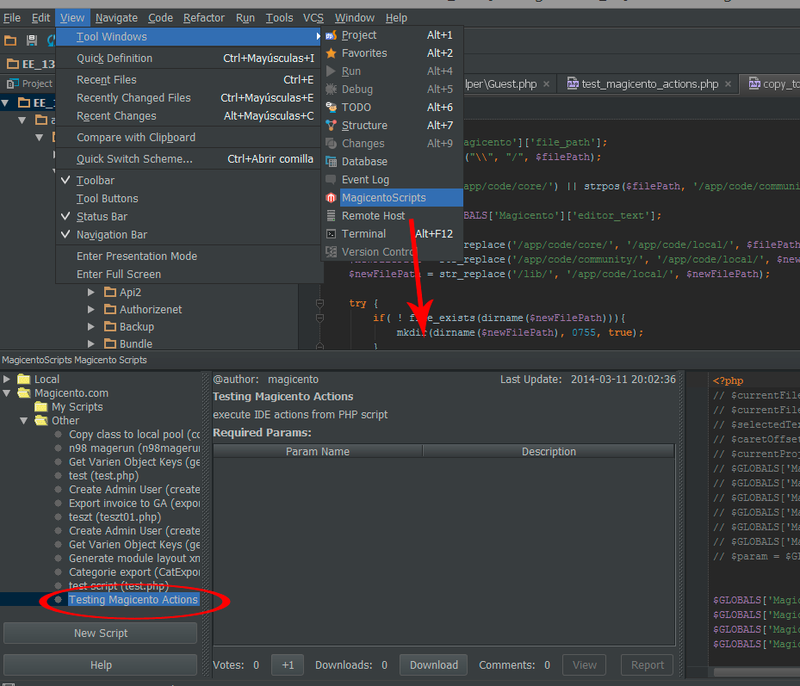 Using PHPStorm 6+ (*) you will get code completion for factories automatically (just use Ctrl+Space like always). This is useful not only for code completion but also for "go to declaration" feature (just use Ctrl+B / Ctrl+Click / middle click (windows)). 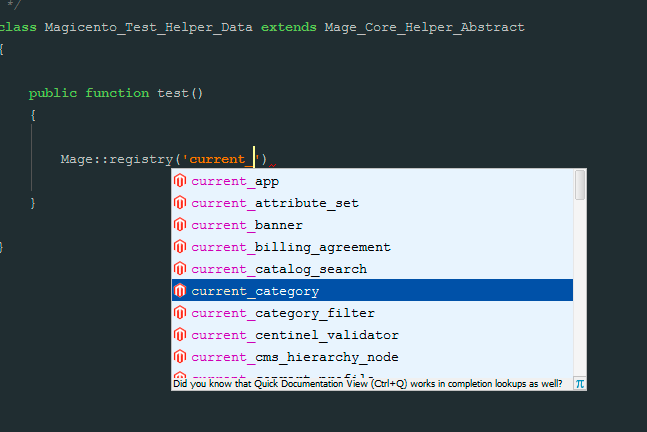 PHPStorm 6+ required (with older versions you can use Alt+M > add @var $this on any .phtml file). Make sure you have enabled this option inside Magicento settings. Note: this could be a big time saver because your class names won't have typo errors anymore, also is very useful when you need to refactor some module name. Use Ctrl+Space after the "extends " keyword. 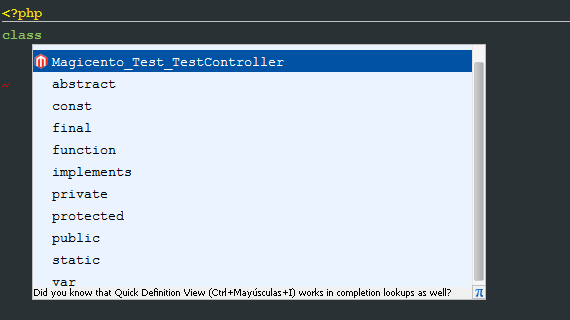 Use Alt+M when the edit cursor is inside the class you want to rewrite and select Rewrite Class or Rewrite Controller. Then select the target module where the new class will be created. And lastly you can change the default class name (proposed by Magicento) for the new class. The "Group" field can be empty and it will use the default one (NAMESPACE_MODULENAME), in the image above the default group is "magicento_test" but it was changed to "mtest"
You can choose if you want to generate the nodes and folders for the blocks, models, helpers (in this case it will create a Data.php file too) and installers. Use your "Go to" shortcut (by default Ctrl+B / Ctrl+Click) on any string representing a factory to jump to the class for that factory. Use your "Go to" shortcut (by default Ctrl+B / Ctrl+Click) on any relative path to some file. Use your "Go to" shortcut (by default Ctrl+B / Ctrl+Click) on any string representing a block name/alias or handle name. Note: sometimes Magicento can't find the <block> nodes where the Block class is used. 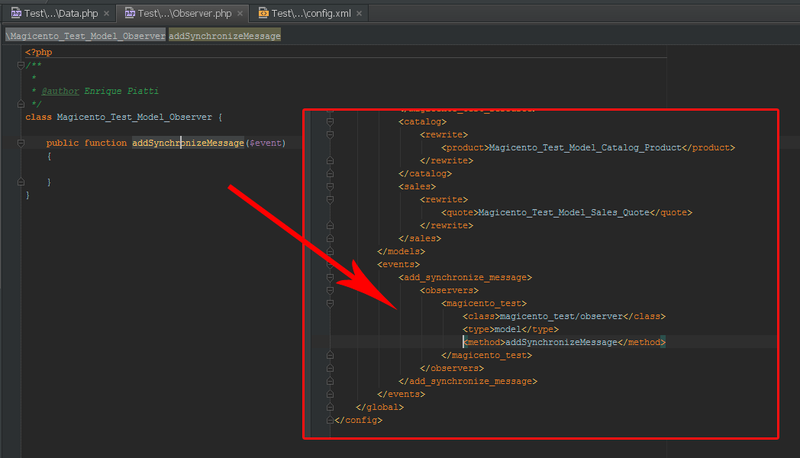 This happens for example when the block is created from PHP instead of using the layout (adminhtml grids for example). 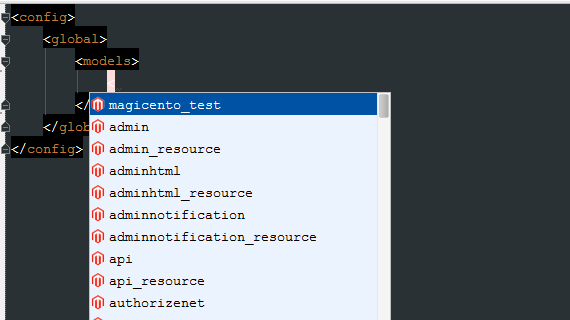 Note: sometimes Magicento can't find the .phtml file/s where the Block class is used. This happens for example when the template is assigned with PHP instead of using the layout. 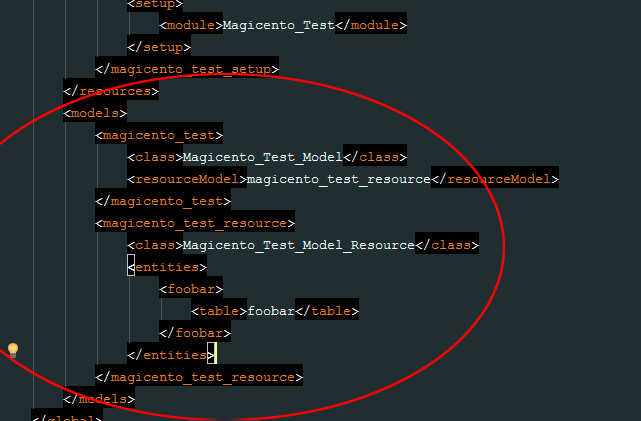 Note: sometimes Magicento can't find the Block class reference by $this in the .phtml file. This happens for example when the template is assigned with PHP instead of using the layout. 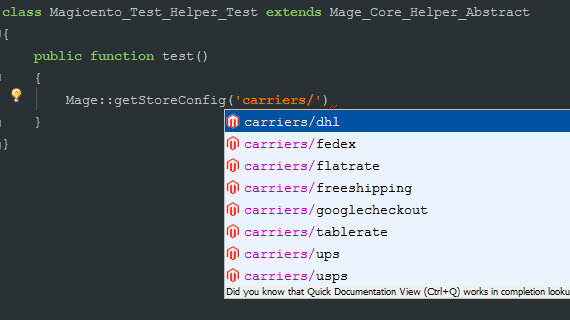 Use your "Go to" shortcut (by default Ctrl+B / Ctrl+Click) on the event name inside any Mage::dispatchEvent call. Tip: try to use it always, on any level, for nodes and also values. 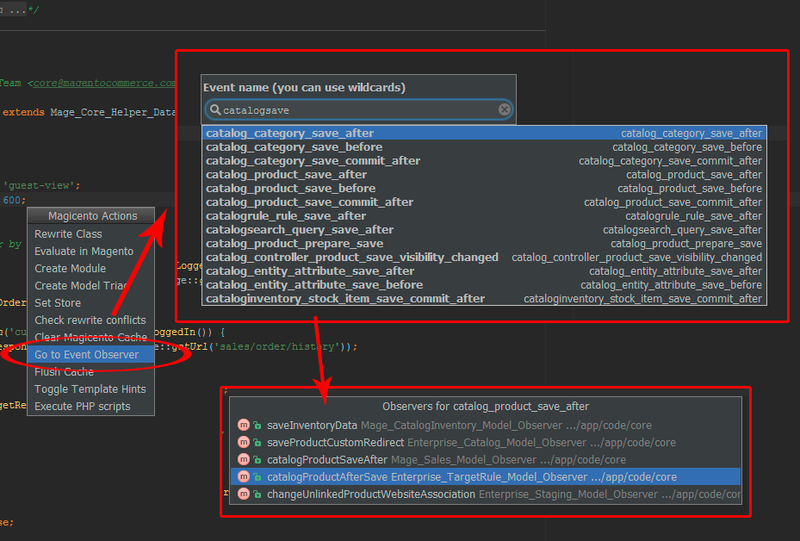 Tip: try to use it always, on any level, for nodes, attributes and values. Tip: if the autoformat is breaking your original format maybe that is because you have the wrong settings for the code styles. 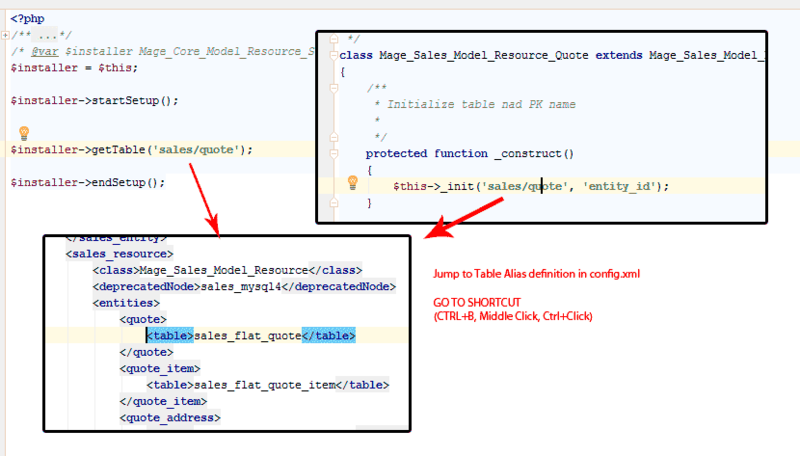 Use Ctrl+Q when the cursor is over some node name or attribute name to get some brief documentation. 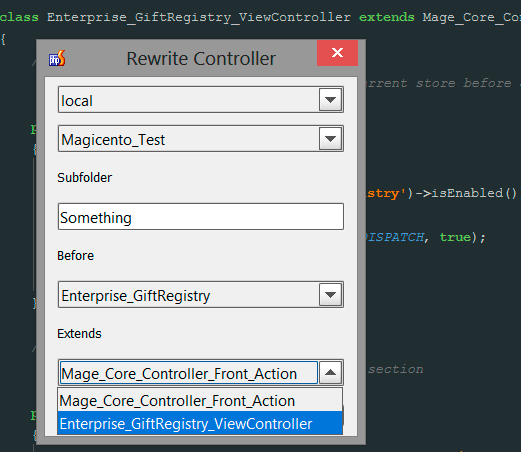 you can disable the auto check for rewrite conflicts from Magicento settings too. 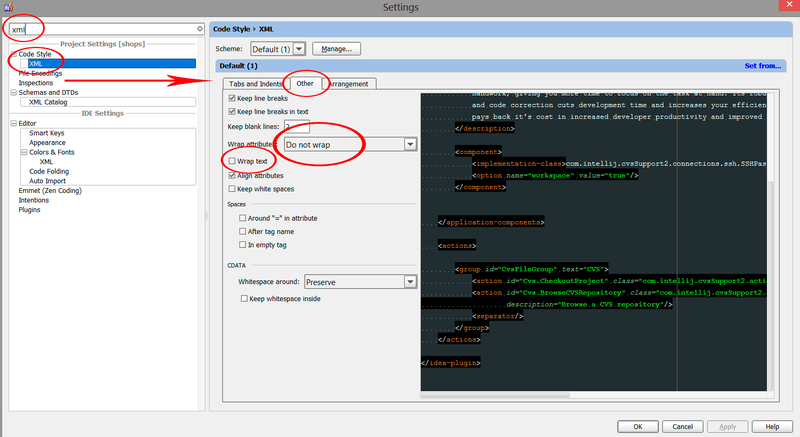 Then you need to select the target Package and Theme (*), a new file with the same relative path will be created there. 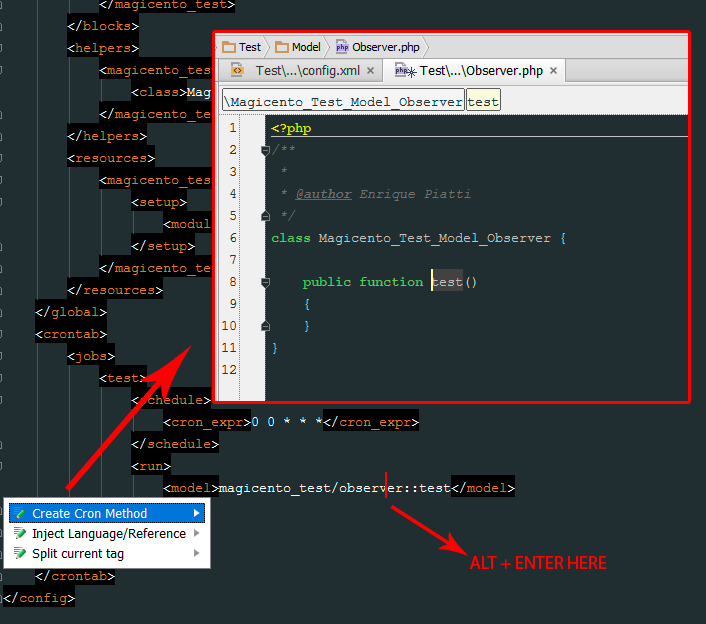 Use ALT + M > Compare Templates when editing any .phtml file, you can select the package and theme to compare with. By default the code is evaluated inside a "var_dump" call, that's why you don't need to put the semicolon, and you can evaluate just one sentence. When you are not using the "var_dump" option you can write any PHP code, but if you want to see some output you need to call "echo" (or some output function) by yourself. You can add your own features writing them in pure PHP! 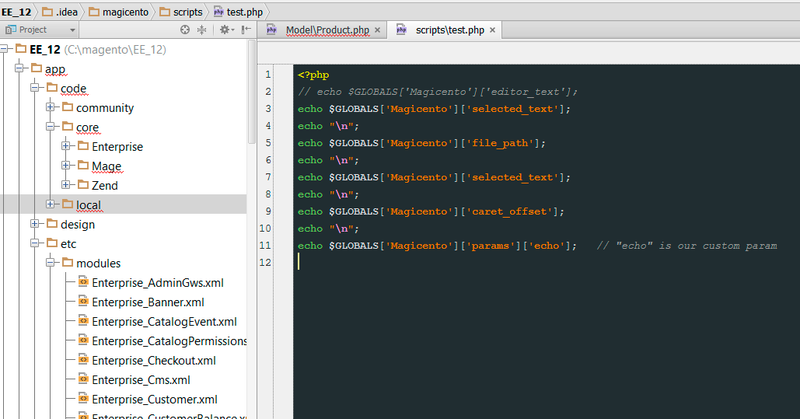 Magicento will execute your script passing your custom params and some information about the file you are editing. * This feature is in alpha state and there are a lot of things to do in this area if the community find it useful. 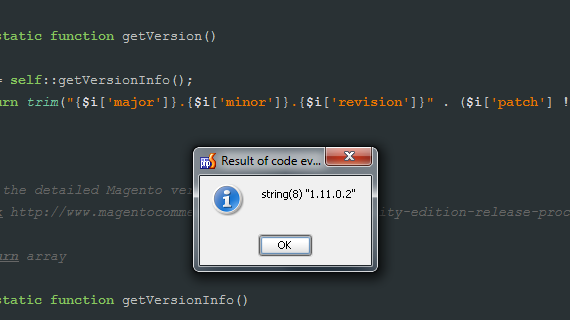 If your project code does not contain the Magento core files you can use Magicento anyway. 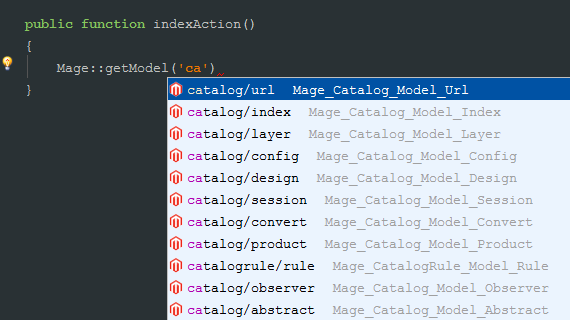 Just set the Mage.php to some local Magento installation. Magicento will create the method in the corresponding observer class (and will create the observer class if it doesn't exist too). 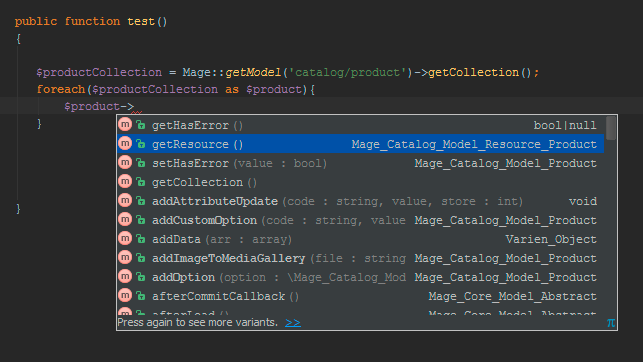 Using Magicento you not only will save at least 1 hour every week (probably much more if you are using all the features), but also your code will be less prone to errors and you will enjoy developing with Magento because you can focus on your specific requirements and let Magicento do the ugly part of your work. New intention action to define custom return types for any method. 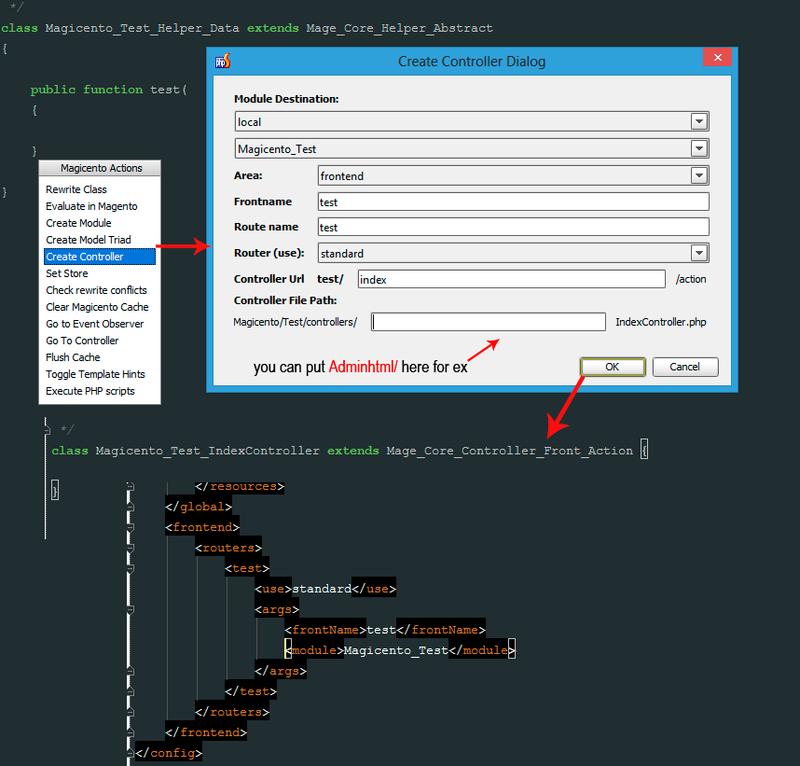 Use ALT+ENTER when cursor is over some method name and choose "Add custom return type inference for this method" from menu. 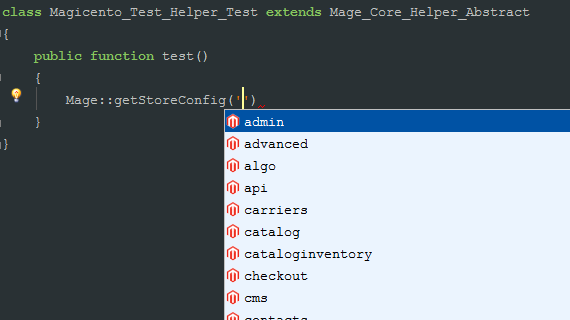 Go to field node defined in system.xml from Mage::getStoreConfig calls or default nodes in config.xml. Use CTRL+B Mage::getStoreConfig('[HERE]') or inside config.xml to jump to the node defining that config in system.xml file. New advanced type inference, better detect for foreach elements and concatenated method calls. Only for PS2016.2+. Disable from Magicento settings if it's getting problems. 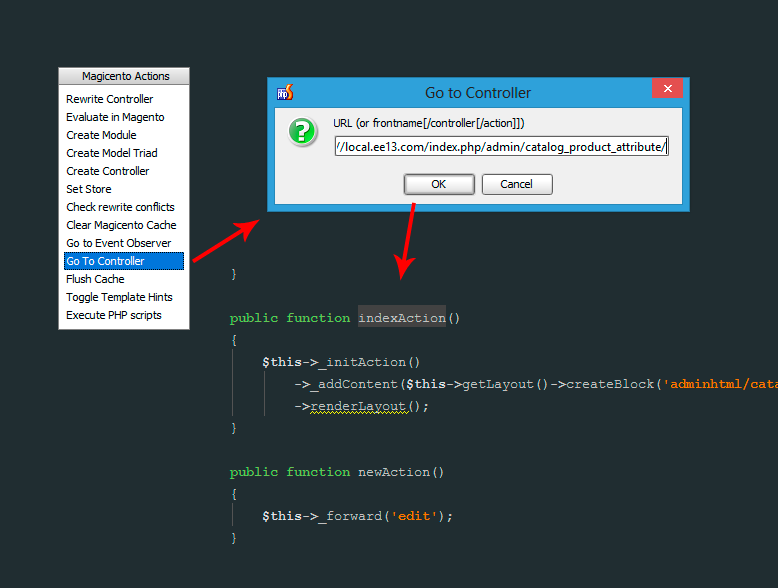 New action: "Create Controller". Use ALT+M > Create Controller anywhere. Added GoTo for observer methods. Use CTRL+B when the cursor is over a method name inside some Observer class to jump to the event|cron node from the config.xml for that method. 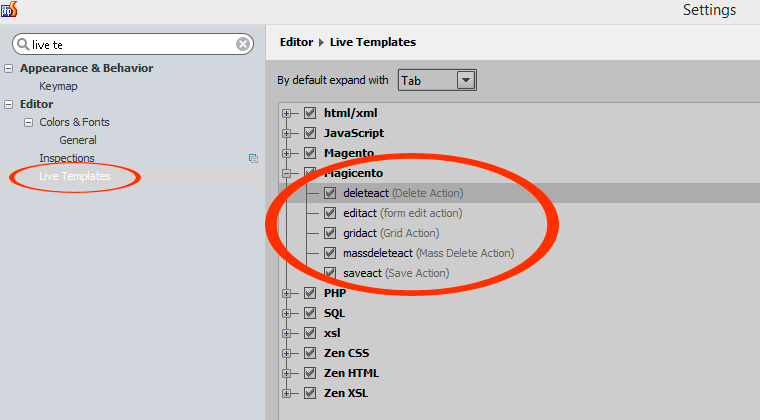 New action for saving the model data keys from the DB so Magicento can give you autocomplete for magic get and set methods. 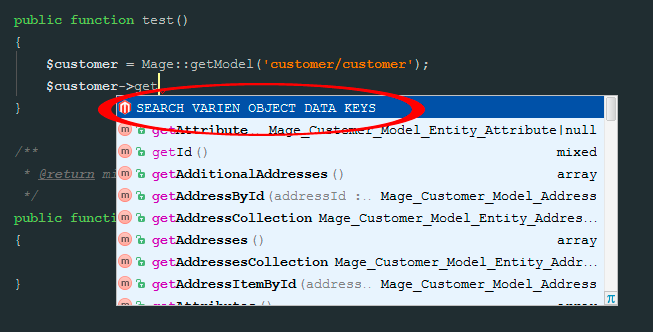 Use ALT+M > Search Model Data Keys whe the cursor is over Mage::getModel('[HERE]'). New Intention for creating Observer from Mage::dispatchEvent calls. Use ALT + ENTER when the cursor is over the event name and select Create Observer, it will create the xml definition on the selected module and the observer class/method if it doesn't exist. 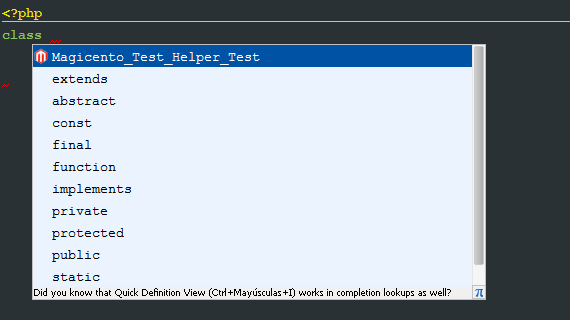 Extended list in code completion list for events in config.xml. 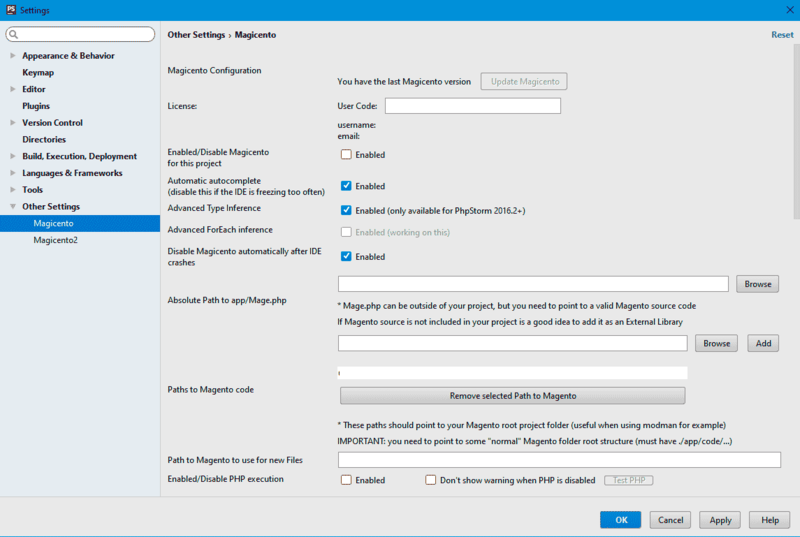 Added support for projects with Magento core code in External Library (you need to set the Mage.php file path to that external path). All files created by Magicento are created in the current project. 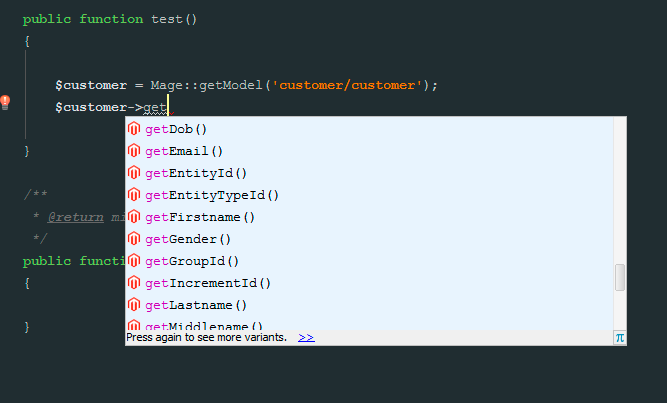 use Alt+M when the cursor is over some factory string, ie: Mage::getModel('[HERE]'), to update the PHPSTORM_META file with the correct class for that factory. Added support for Rewriting controllers (Alt+M > Rewrite Controller when editing some controller, put the cursor inside the class). New actions for translating text. Use Alt+M > Add Translation when the cursor is over $this->__('[HERE]') to define a new translation (it will be appended to the selected csv file, or create a new csv if not exist). 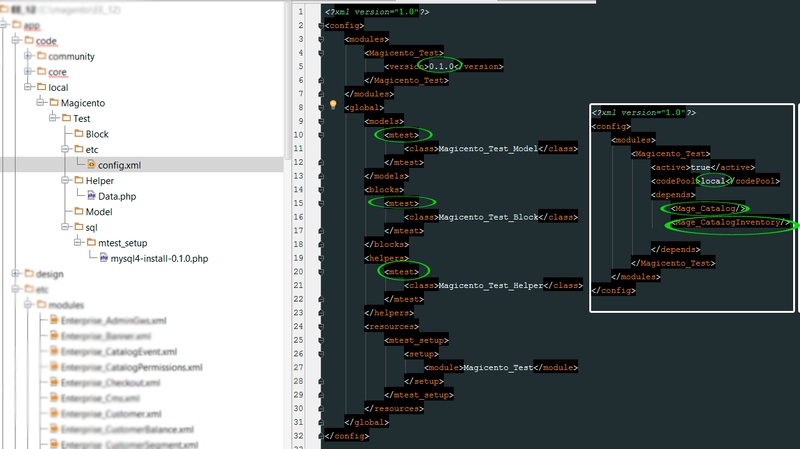 Starting code completion on layout xml files. In this release only handles are supported. 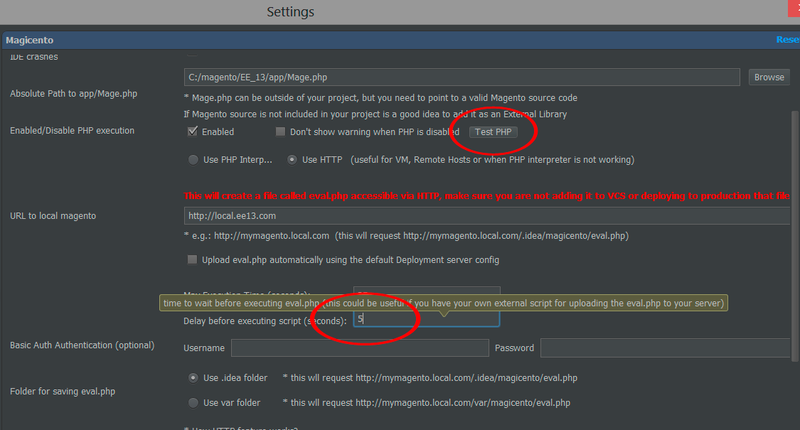 New setting option for executing PHP code in magento using an HTTP request directly (useful when PHP is not accesible directly for example when using VM). Create Plugin intention. 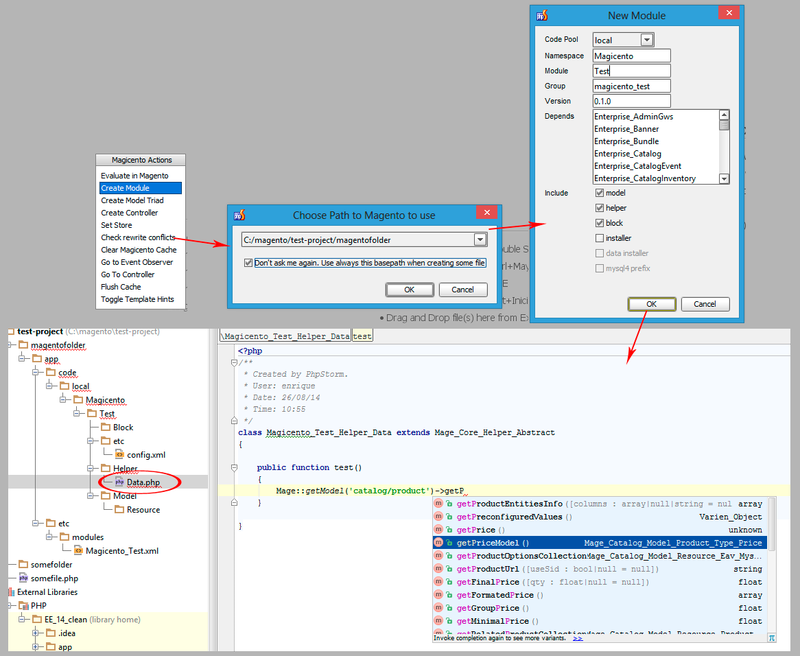 Use ALT+ENTER when cursor is over some method name definition and select Create Plugin to create a Plugin (after/before/around) for that method. Code completion for class name and namespace when creating new classes. 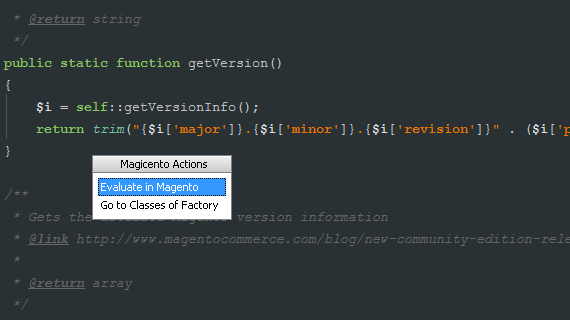 Use: "class [CTRL+SPACE HERE]" or "namespace [CTRL+SPACE HERE]"
Refresh Magicento2 Indexes Action (ALT+M). Useful to refresh internal index if is not updated for some reason. 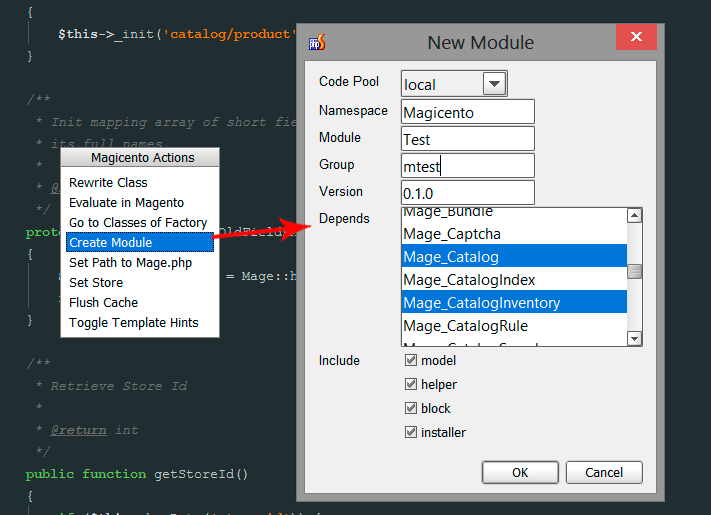 Magicento will work automatically on your Magento projects (if not please check the configuration going to File > Settings > Magicento). You have only one shortcut: Alt+M (Option+M on mac). This shortcut is context aware, that is, you will see different options depending where the cursor is (a var definition, a .phtml file, a Block class, an intaller script, an xml etc). 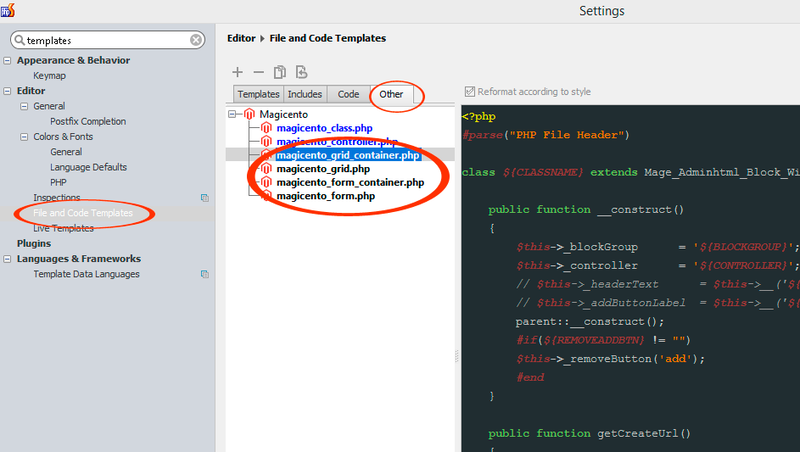 The rest of the features from Magicento are accesible using the original shortcuts from PHPStorm (Ctrl+Space for autocomplete, Ctrl+B | Middle Click | Ctrl+Click for "Go to..", Ctrl+Q for documentation). Another option is tou use your private link (the one you have used to download Magicento the first time, you should have this in your email too), every plugin is unique and has a unique link to download your version. If you don't have your private link please email me and I will send it again. 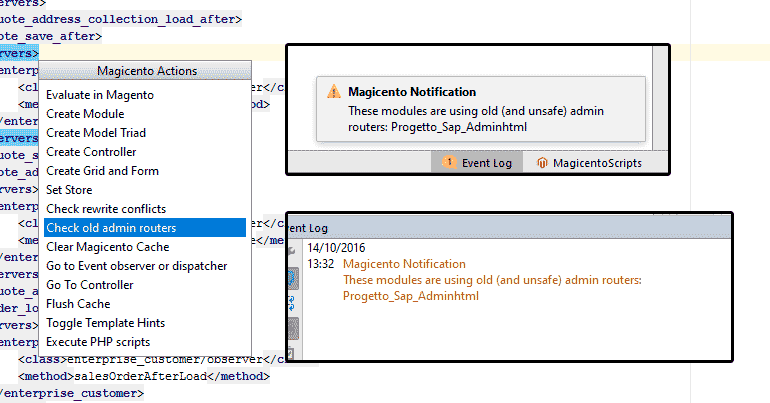 Magicento will show an alert when a new version is available. How to inform about issues/problems? Please use the issues tab on github: https://github.com/enriquepiatti/Magicento/issues. If you don't have a github account send an email to "issues at magicento.com" describing the issue, with the full trace of the exception if it's available. How to suggest new features/ideas? 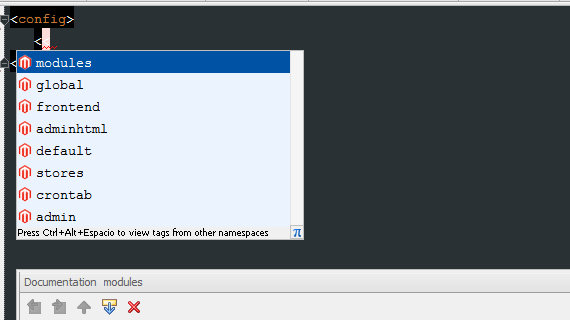 You can uninstall it from the plugin section on the settings panel of the IDE. 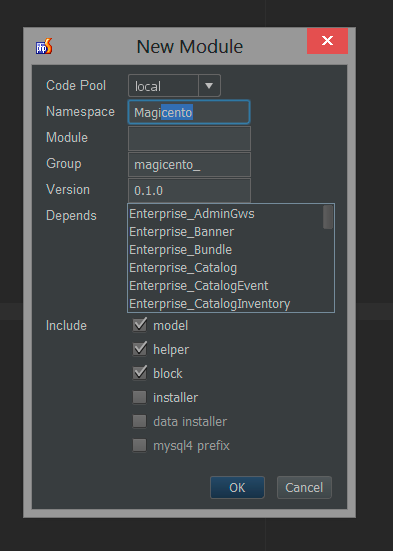 Or if you want to disable it just for the current project goto "magicento" section inside the settings of the project and disable it from there. PHPStorm is broken/frozen, how to solve it? Try first uninstalling Magicento: How to disable Magicento? If that doesn't work either try removing indexes, or remove the /.idea	folder from your project (the IDE should start correctly if you don't start it with an opened project, and then you can remove or disable Magicento from there). And don't hesitate to contact me by email: contacto@enriquepiatti.com or skype: enriquepiatti. 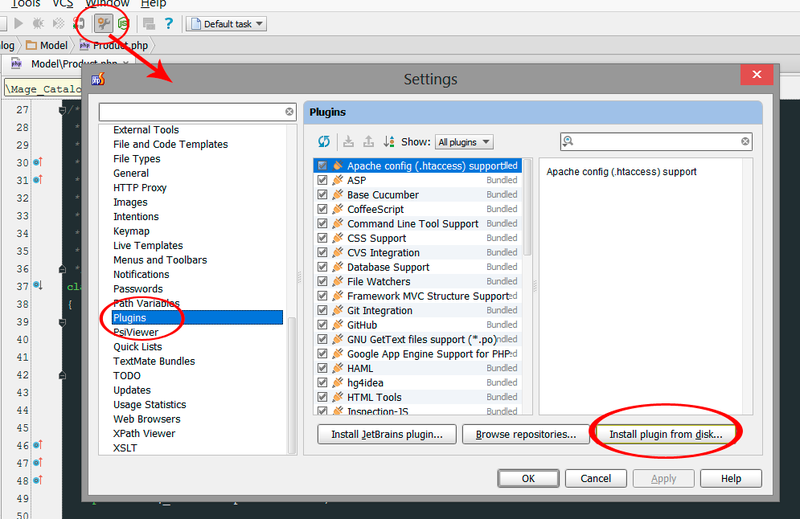 Make sure "IntelliLang" and "XPathView + XSLT Support" plugins are installed and enabled. 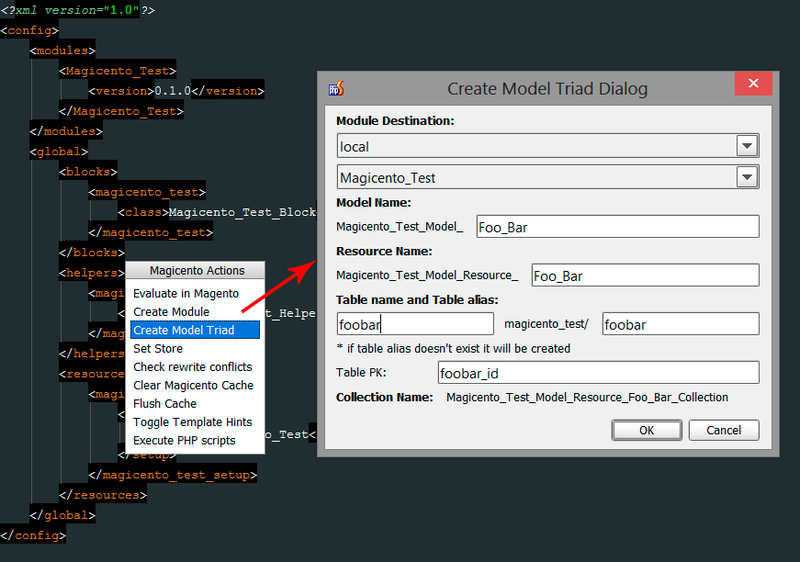 Also check you don't have any other plugin causing some conflict. If you are getting that error when trying to install Magicento, then probably your magicento.jar is corrupted, please contact me in that case. What is the difference between Magicento and Magicento2? They are two different products (each one with it's own license). 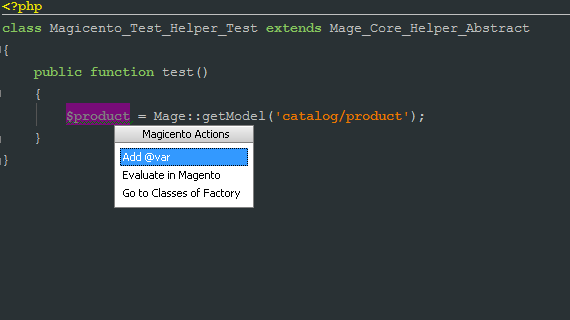 Magicento2 is a plugin to work with Magento 2.x projects and Magicento with Magento 1.x projects. 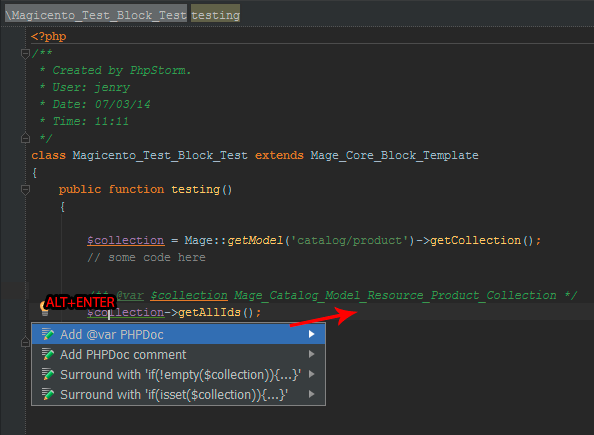 What versions of PHPStorm are compatible with Magicento? 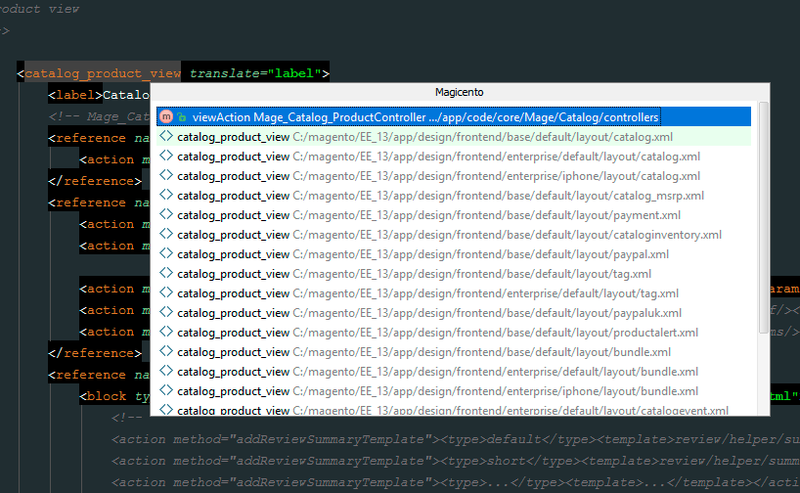 Magicento was successfully tested on PHPStorm 2016+ using Windows, MacOs and Linux.